When it comes to Australian Literature, no one ever has to tell me twice to pick up a novel. I truly believe that there is something down in Australia or some magical trick professors are teaching their writing students because no Australian novel, to date, has ever failed to keep me thoroughly entertained, captivated, and in awe. I am happy to report that Shadows by Paula Weston is no different. While its cover is not one of my favorites, its characters, dialogue, and rather unique plot definitely is. Ever since Gaby’s twin brother, Jude, died in a car crash, she’s been having strange nightmares of battling demons with a beautiful boy. When Rafa, the gorgeous guy of her dreams, hunts her down from the short story website where she submitted the imaginary tale she believed her nightmares were, her world is turned upside down. Not only does Gaby learn that she was supposed to be dead along with her brother, she is told that she is a half-angel. Yet, most shocking of all, is that her past memories, which have evidently been replaced by a normal human childhood memories, are all false and in reality, she is stuck between two sides of a dangerous conflict between the Rephaim, the new name the half-angels, or Nephilim, have taken for themselves. When Gaby’s best friend is kidnapped, Gaby has no choice but to embrace her fate and come to terms with who she is, who she can trust, and just what lies in the world beyond her. I apologize for the rather long-winded and confusing synopsis, but this novel has a lot going on. Yet, it is all explained in an extremely well-paced manner and I was pleasantly surprised by the lack of paragraphs of information-dumping. Instead, the details and world-building are evenly spaced out and have a very smooth and flowing transition. Furthermore, while the plot of this novel isn’t entirely original, I enjoyed Weston’s spin on it and her take on angel lore was easy to understand, made a tremendous amount of sense, and wasn’t filled with superfluous facts. 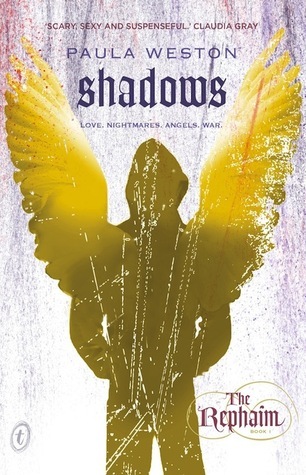 Yet, what truly made Shadows stand-out from other angel fiction was its characters. I suppose we should start with Gaby – I loved her. Her narration was sarcastic, witty, intelligent, and simply refreshing. Unlike most protagonists, I thought she handled the new information dumped upon her in a very mature manner and while she has her flaws, she remained a strong and courageous character throughout. Perhaps what I loved best about her was her friendship with Maggie, her best friend who later gets kidnapped. I’m a huge fan of strong friendships and their relationship left me wanting my own best friend by my side as it was truly heart-touching. Plus, Gaby’s love and grief for her twin brother was sharp and easy to understand and I loved the manner in which it shaped her character. In addition to Gaby, secondary characters such as the members of the Rephaim and Jason, Maggie’s latest boyfriend, were all very interesting and brought forth a lot of humor and bad-assery to the novel. Yet, Rafa by far stole the show. Not only is Rafa hot, he knows he’s immensely good-looking, which often makes him cocky. However, beneath all that, Rafa is trustworthy and as Jude’s best friend, he truly cares about Gaby. While I’m still a little confused and curious about the mysterious (and rocky) past that Rafa and Gaby shared, I ate up the sexual tension between them and am very curious to see where their relationship leads them. It was definitely rather unique and their character personalities themselves are quite original too, which brought in a nice change to their love story. Gaby seems like a great main character. I can't wait to meet her. I clearly need to read this so I can meet Rafa! I don't love the fact that a lot of questions go unanswered at the end, that's always a touch frustrating, but everything else sound fantastic. I always enjoy it when the secondary characters are as strong as the main characters, it makes the book so much richer I think. I just finished Angelfall and LOVED IT, so while this one isn't quite as good, I'm glad it's still a solid story. Fabulous review Keertana! I just keep hearing one amazing thing after the other about this book! It thrilles me that you joined the fans, I am now absolutely positive that I want to read it asap. To tell you the truth, angel books soft of make me run for cover, but this one appears to be different and I'll definitely give it a chance. A heroine like you described isn't something I want to miss, and as Hilda says, I need to meet Rafa too. Plus, I love that you mentioned Kate Daniels, lol. You totally had me with that one. I am so happy to hear that you loved this, and I had a laugh at your apology for the long synopsis overview because you're right, there is so much going on in this book, but it all works! I loved Gaby, too, what a great MC and the tension between her and Rafe was just perfect! Great review, Keertana! YES! To everything you said! Including something about Aussies and magical powers. Okay, fine, not exactly what you said, but still :P Shadows really surprised me as it wasn't at all what I expected it to be ... in the best possible way. I LOVED Gaby's narration and Rafa... mmhmm, gimme more Rafa, please :D I can't wait to see what Paula has in store for the sequel and to reveal what the heck happened with Gaby and Rafa in the past! So glad you loved this, AWESOME review! Seriously, what DO they feed their authors in Australia?! I'm with you, I only need a recommendation and I'm off. I'm glad to hear you enjoyed this one, even if the ending left you somewhat wanting. Maybe I'll wait until this series continues before picking it up, as I'm terribly impatient for that sort of thing. But really, the only thing you need to do is mention Gabby's name in tandem with Kate Daniels and I'm sold! One card consists 100 points. A third party company is used by Sony for this purpose called Live Gamer. We believe that he was one of the mightiest messengers of Allah Subhana Wa Taalah - of Almighty God. You will find that it is very difficult, if not impossible, to maneuver a long RV up the road that leads to Jerome. Black heads are removed, skin problems addressed and even ex-foliation is available.